Gadfly Records is proud to announce the release of "Hold With Hope," a breakthrough CD from the popular northeast bluegrass quartet Breakaway. Since bursting on the scene in 1988 Breakaway has provided world-class bluegrass entertainment to a growing fan base, winning over audiences wherever they perform. An authentic and uncompromising vocal section forges Breakaway's trademark sound, along with the instrumental support of the band's highly-praised "27 Strings" (go ahead-count 'em! ), which together deliver the real bluegrass deal each time. After honing their skills for seven years with a weekly gig in their home state of Vermont, Breakaway released the critically-acclaimed "Unpaved Road" (1994). That same year they won the coveted Winterhawk Band Contest and they became instantly established on the national bluegrass scene. The group's 1997 CD "Watershed" further solidified their reputation and convinced the critics that Breakaway was here to stay as a fixture on the bluegrass scene. 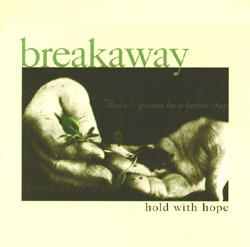 "Hold With Hope" is yet a new benchmark for Breakaway, the group's most accomplished and polished recording to date.